This recipe may be in fact Italian, but Prosciutto from the region of Evritania has been produced for decades at a particular smokehouse from pigs of their own breeding and it is considered a local type of cured meat. A whole ham is slightly salted and then hanged and left to dry in cellars, under special conditions of humidity and temperature. It is one of the finest cold cuts produced in Greece. Lately, more and more Greek quality cold cuts are emerging, proving they are just as delicious as their foreign counterparts. 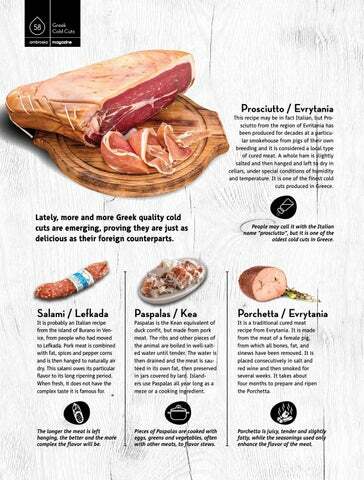 People may call it with the Italian name "prosciutto", but it is one of the oldest cold cuts in Greece. The longer the meat is left hanging, the better and the more complex the flavor will be. Pieces of Paspalas are cooked with eggs, greens and vegetables, often with other meats, to flavor stews. Porchetta is juicy, tender and slightly fatty, while the seasonings used only enhance the flavor of the meat. It is probably an Italian recipe from the island of Burano in Venice, from people who had moved to Lefkada. Pork meat is combined with fat, spices and pepper corns and is then hanged to naturally air dry. This salami owes its particular flavor to its long ripening period. When fresh, it does not have the complex taste it is famous for. Paspalas is the Kean equivalent of duck confit, but made from pork meat. The ribs and other pieces of the animal are boiled in well-salted water until tender. The water is then drained and the meat is sautĂŠed in its own fat, then preserved in jars covered by lard. Islanders use Paspalas all year long as a meze or a cooking ingredient. It is a traditional cured meat recipe from Evrytania. It is made from the meat of a female pig, from which all bones, fat, and sinews have been removed. It is placed consecutively in salt and red wine and then smoked for several weeks. It takes about four months to prepare and ripen the Porchetta.